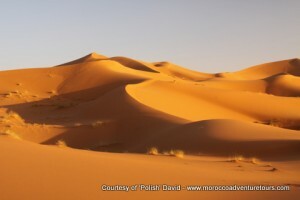 A once in a lifetime trip to the huge sand dunes of the Sahara Desert at Merzouga. 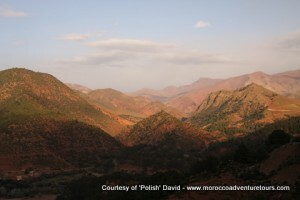 After an early start in Marrakech, we stop for breakfast and cross the Tizi-n-Tichka Pass over the Atlas Mountains, dropping down the other side to Ait Ben Haddou, the hill-fort featured in Gladiator and a host of other Hollywood blockbusters. After some lunch and the obligatory souvenir photos, we continue through the movie-making town of Ouarzazate and onwards to the stunning Dades Gorge where we stay for the night in a basic hotel. Leaving the hotel, we continue to the beautiful Todra Gorge, another great place for some pictures. 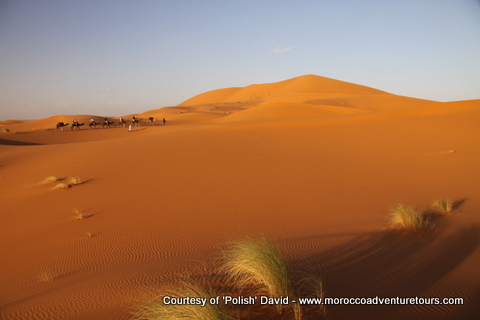 After this we head into Merzouga and swap the minibus for a camel, the traditional method of travel in these parts. 90 minutes of riding through the dunes and we arrive at the desert camp where musicians prepare a fire, fresh tagines and drumming for the evening. 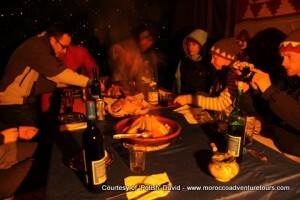 Check out the stars and see how your Saharawi drumming skills are! Back onto the camel for sunrise for the ride back to the minibus and the long return drive back to Marrakech. 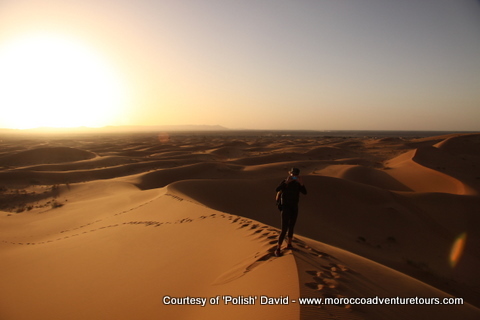 We stop at Ouarzazate for lunch and a leg stretch before re-tracing our steps over the Tizi-n-Tichka and back to your accommodation in the city. We run these tours by request and try to be as flexible as we can – just let us know what dates suit you best. We only need 4 people to run these tours ourselves. If we can’t get 4 people together, we’re happy to either arrange this tour with one of our partner companies or offer you a refund – the choice is yours.